When I joined the “work from home” world, I imagined it would be a land of fun and freedom. Partly it is but the numerous distractions really limit productivity. From the mounds of clothes that need to be washed, house begging to be cleaned, and the fridge asking to be pillaged, these small “things to do” in the back of the mind prove to create a work procrastinator. While I continue to improve upon my willpower, my current solution is to work from anywhere else that is not home. A few of my buddies work from home as well so sometimes I’ll stop by. But even then we get cabin fever and venture out to find virtual workspaces. Although independent cafes and coffee shops are usually OK, they are usually small and crowded. Franchises such as Starbucks has GREAT wifi (most, if not all have Google WIFI) but leaves several days of coffee stink on my backpack and my jacket. Not to mention most don’t have great seating accommodations. Enter my favorite franchise cafe for remote work, Panera Bread. The seating is always warm and comfortable, with conference style desks, and lots of room. Typically I’ll work a few hours remotely before heading back to the home office. Since time is money, working and eating lunch at Panera is usually a good combination. Unfortunately, the wifi is not as fast as Starbucks and they limit their wifi during peak hours such as lunch and dinner to 30 minutes per device. Unfortunately, at many locations, the wifi is not as fast as Starbucks Google Wifi and they limit their wifi during peak hours such as lunch and dinner to 30 minutes per device. While I have no control over the wifi speed, there is an easy geek hack to bypass time restrictions. Technically you are not hacking their wifi, you are just bypassing the restrictions. Even with zero technical skills, you can easily download a freeware program (yes, this means FREE) such as “Technitium MAC Address Changer” that will change your network adaptor’s unique identifier so that Panera’s access point will think you are an entirely different device. If you have a wireless card and are having issues changing the MAC, see this help post. Note: This simple life hack should work at any other establishment that restricts devices by MAC address. However, aside from Panera Bread, I am not aware of any. Thanks for reading and I hope this helps your productivity when working remotely. 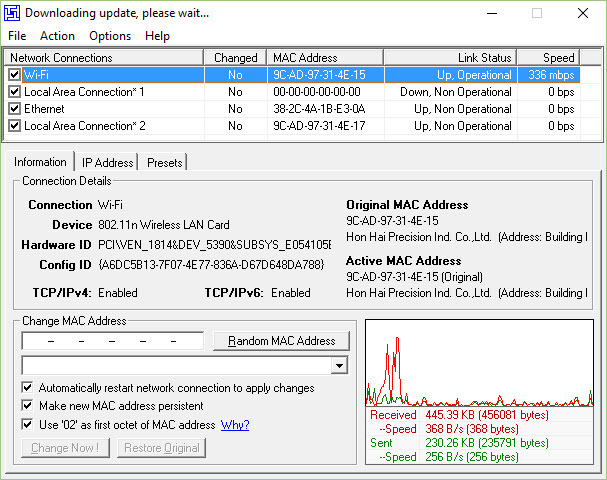 This hack is for windows machines but I found this article about MAC address spoofing on a OSX (MAC computer). If you have any other comments, suggestions, or improvements to this article, please comment below! Tim Cross from Panera Corporate replied to this (surprisedly high traffic post), in the best possible way. However, speed is very slow…they need to increase their bandwidth. At best, I might be streaming music and low bandwidth utilizing tasks. 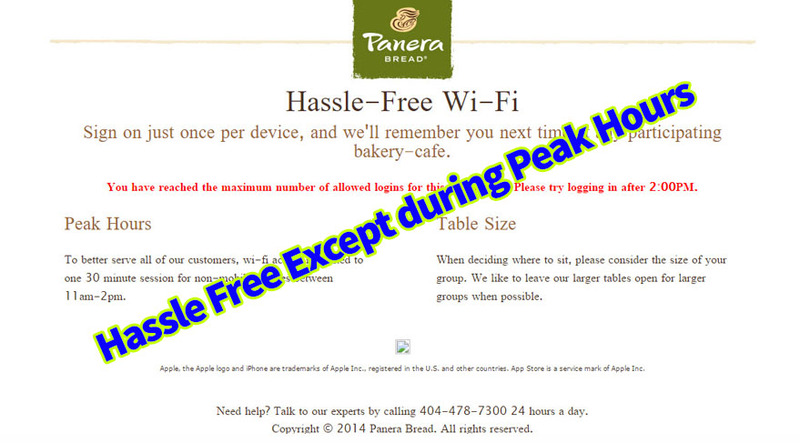 I appreciate the feedback in the article on Panera’s Wi-Fi and have ran across it several times over the past years. We love customers to come to our café and use the Wi-Fi and has been part of our attraction over the years. We have heard the friction this time restriction caused our customers and have removed this time limit in the majority of cafes in 2016. Hopefully, we are providing our customers a great experience in the café and are working to improve it further. We know how important wireless connectivity is to our customers for business and pleasure. We don’t have any issues with the article or customers performing those steps on their computers but changing the MAC address is not required over the past 18 months to achieve the same results. I appreciate any feedback on how we can make the Panera gathering place experience better – technology or otherwise. Happy surfing and hopefully you are frequenting our cafes.